Creating statewide vertical alignment between all levels of education ensures that students are ready for college-level study upon graduating high school and, over time, strengthens the regional workforce. Academic Vertical Alignment Training and Renewal (AVATAR) began in 2010 through a grant to the North Texas Regional P-16 Council, administered by the University of North Texas, for developing a model for vertical and horizontal course alignment. The model was to be disseminated using a “train the trainer” approach with the regional Education Service Center (ESC) and then used statewide to align the core curriculum across secondary and post-secondary education, using the Texas College and Career Readiness Standards (CCRS) as a foundation. 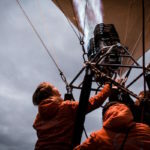 Academic Vertical Alignment Training and Renewal evokes the AVATAR acronym, alluding to the well-known science fiction movie in which humans are enabled to become more insightful and adept at collaborating to create a better world. AVATAR aims to create better-aligned educational systems that allow students to progress successfully. Over the last four years, the AVATAR project has developed vertical alignment teams (VATs) in 13 regions of Texas to aid students on their journeys from the classroom to the Texas workforce. 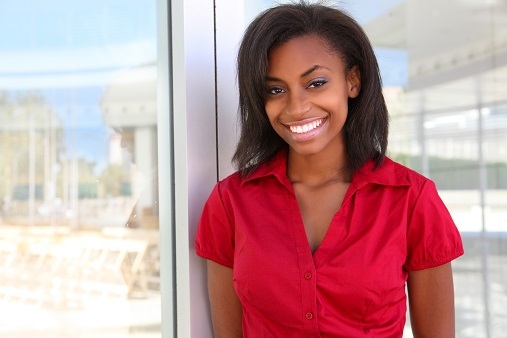 Many public high school graduates who attend two- or four-year higher education institutions enroll without a deep understanding of specific and necessary elements of the requisite discipline; thus, they require remediation, which may lead to dropping out. The national college readiness gap demonstrates that approximately 75 percent of nonselective two-year college students and nearly 50 percent of students enrolled in regional, less selective four-year colleges require remediation (SREB, 2010). Approximately 90 percent of Texas students (FY 2005-2007) who passed Algebra II in high school took a developmental education math course at a two-year institution. Approximately 60 percent of Texas high school graduates who passed Algebra II started in developmental math at four-year colleges (THECB, 2008). In 2008, the Texas College and Career Readiness standards (CCRS) were adopted. The state of Texas administered Algebra II end-of-course (EOC) exams in 2009-10 and the results indicated 57 percent of the more than 78,000 tested met the standard and 11 percent demonstrated commended performance. For biology and chemistry EOC exams, the 2010 results yielded 57 percent and 46 percent mean correct responses on the exams respectively. This means that despite the alignment between the CCRS and the Texas Essential Knowledge and Skills (TEKS), there is still a gap in students’ performances and college readiness. Additionally, all Texas high school graduates who pass the EOC exams in college Algebra II and English III will be eligible for credit-bearing courses at most Texas public higher education institutions, which supports the need for sound vertical alignment of course curricula. In AVATAR’s first year, VATs in Regions 10 and 11 piloted development of its model. 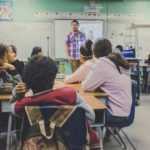 Through their work, the AVATAR defined processes for developing more common knowledge bases between secondary and postsecondary educators and for engaging in critical conversations about important aspects of course alignment between secondary and postsecondary education. After engaging in critical conversations, regional VATS develop action plans that lead to changes in instruction, course and campus policies and procedures, counseling practices and/or expectations for or of students as they negotiate regional pipelines more adeptly. Together, these partners constitute a genuine educational feeder pattern for students. Team planners have learned to use the Texas Higher Education Coordinating Board’s data website in determining the extent to which potential partners send and/or receive students from other partners. A key AVATAR goal is to make a difference in students’ access and success as quickly as possible. As partners are identified, it’s important that VAT members be selected who are knowledgeable about the core curriculum and have the ability to influence other discipline faculty in implementing recommendations that grow out of the action planning. Also important is the commitment of academic leaders in school districts and institutions to participate and support recommendations for action that may call for changes in curriculum, instruction, instructional materials, policies, assessment, technology and/or professional development. In 2013-14, 11 AVATAR partnerships are active across the state of Texas. Most began their work in 2012-13 by forming VATs that studied and filed action plans at the end of the year that pertained to one or more academic disciplines. 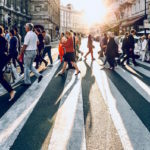 In their second year of work, some regional partners focused on continuing the present work, while others formed a second VAT while continuing or, in some cases, reshaping the first year work. Locations of the partnerships are grouped according to the content field(s) in which they are vertically aligning courses and curriculum. External evaluation of AVATAR in 2013 demonstrated that team members from secondary and postsecondary institutions valued the opportunity to meet and discuss frankly their discipline content, students’ successes and instructional practices. 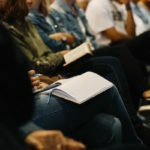 While it might seem obvious that educators from secondary and postsecondary institutions should have these critical conversations, most had never met with their counterparts. Becoming friends, sharing resources, considering the implications of local student achievement data, visiting in one another’s classrooms and listening to students who were part of a common regional pipeline led to eye-opening conversations and learning for VATs. Some college faculty didn’t know about the TEKS. By June 2013, all could see these conversations would be influenced by the new directions of House Bill 5 (HB 5), which outlines the state’s new graduation requirements. 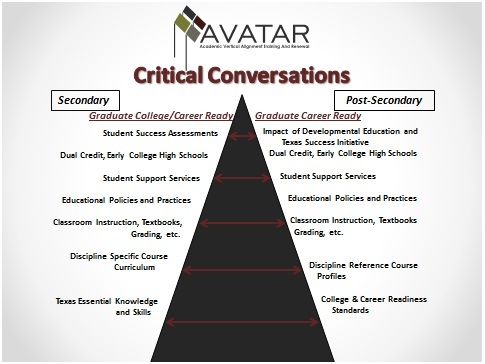 AVATAR provides a structure for thinking across educational levels about support vital to students’ college and career readiness and success. Through AVATAR, P-16 Councils, secondary institutions, two- and four-year higher ed institutions and, in some cases, businesses and industries have collaborated to create pipelines of student success in college and career readiness across the state of Texas. For more information on AVATAR, please click here. Fascinating piece on the effort to vertically align education in Texas. By bringing those partners that Keller identifies to the planning table, the state can ensure that students experience a seamless transition from K-12 to postsecondary education. This helps to remove some of the barriers to higher education, and could also benefit institutions by not requiring as many remedial programs to bring new students up to a postsecondary learning level. Call me a cynic, but I’m doubtful that simply bringing different partners to the table will solve any alignment issues. The fact of the matter is that these different bodies continue to be funded by different parties and at different levels. This makes any true alignment difficult to achieve without the full consent of all parties. The table would, at best, be able to share a few best practices and make small changes to some curriculum or policy; anything further is simply unrealistic.